The Mississauga St. Michael's Majors were finishing off a 3-1 win against the Niagara Ice Dogs in their home opener on Oct. 3, 2008, when 17-year-old forward William Wallen suddenly started experiencing blinding headaches. Wallen, who had arrived in Mississauga just weeks earlier after playing in his native Sweden, became disoriented and eventually vomited. Something was wrong. "We're taught in second-year medical school that the worst headache of your life is a ruptured aneurysm," said Dr. Tim Rindlisbacher, the Majors' team physician who was at the game that night. "I wanted him to get to the hospital really fast." What some thought might be a bad headache turned out to be a bulging blood vessel in Wallen's brain that had burst and was bleeding. There was a 50 percent chance he might die. But in an inspiring comeback that would make waves across the hockey world, Wallen was back on the ice a few months later. That October night, Wallen was loaded into an ambulance in full gear and taken to the nearest emergency room where he was met by his mother, who just happened to be visiting from Sweden. Over the next 48 hours, Wallen had two procedures implanting metal coils in his brain before spending the next two weeks under observation. "I was exhausted [after surgery]. I couldn't eat, I couldn't drink," Wallen told NHL.com. "Then I went back home to Sweden. I started taking short walks with my dog. I would go 100 meters and then I was so tired, I just had to turn around and go back and sleep." By Christmas, Wallen was allowed to begin rehabilitation. But considering his brain, body and nervous system had undergone severe trauma, the task of getting back on the ice was daunting. The job was handed to Joe Costa, the team trainer in Mississauga. "His body was almost like a stroke victim; everything just shut down. Nothing was working in synch," Costa said. "We had to work so much on marginal stuff. Like stabilization, mobility of his joints, flexibility of his muscles. He couldn't even squat. So we modified his workout specifically to him. We had to rewire his brain and his body to work effectively." Working with Costa in Mississauga, Wallen went through the incredibly frustrating process of training his body and brain to withstand the most basic stresses. All Wallen wanted was to play hockey again. "I wanted to play as soon as possible. It was so hard. I was so out of shape," he said. "It was a struggle, but it was worth it." With two workouts a day, six days a week, Wallen eventually got back into game shape, rejoining the Majors in February, barely four months after nearly dying. In his first game back, he scored a goal. 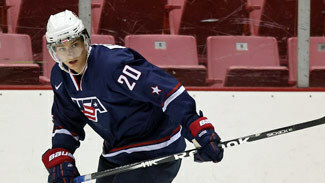 He finished the season with 22 points in 30 games, then starred for Sweden in the 2009 World Under-18 Championship, totaling eight points in four games. "When I got back, my teammates were awesome," Wallen said. "I was glad to be back with the guys. It was just an awesome feeling." Among the people most impressed by Wallen's comeback was his father, sports agent Peter Wallen. So it wasn't long after his son's return to Mississauga that Peter Wallen brought Costa to Sweden to help him train some of his young clients, including future first-round pick Gabriel Landeskog. "There is sports science behind everything. That's what we're bringing to Sweden for the last three years, with help from Joe," Peter Wallen said. "The coaches over in Sweden don't work like this. They miss the whole mental and emotional part of it." Costa has since become one of the more in-demand trainers in hockey. Other than working with Peter Wallen's clients -- including Landeskog, Victor Hedman and Jacob Josefson -- Costa has been applying his work with Wallen to summer workouts with several other NHL players, including Kyle Quincey, Shawn Matthias, and Jamie McGinn. As for William Wallen, he spent the 2009-10 season with Mississauga then returned to Sweden, and in 2012-13 he'll play for Kallinge/Ronneby in Division I. He still hopes to play someday in the NHL, but in the meantime the strides he made following his aneurysm have made an imprint on the hockey world and left him with some profound perspective. "You never know what will happen," he said. "You should be happy with what you have and the people that are around you."